Ceres in Astrology. Protectress. Child separation or abduction - Madeleine McCann. Mother Nature. Growth from seed into maturity, whether grain or human seed - baby/maiden/mother. The dwarf planet Ceres is becoming very important. She represents Mother Nature and the growth of all things - from human babies into mothers, and grain into crops. She also represents the loss of these things loss of life, death - child abduction and crop failure. In 2007 she saved our crops from total loss by protecting us at the last minute. She stopped the rain and dried out the fields. But most importantly, she supports in death and with death `rights`. Consider this - when we are faced with death, the strangest of things can happen. We grow. Our soul grows. We can see and feel the intensity of a flower. We can experience a side of ourselves that would be unknowable otherwise. We see our soul, and the reason for it`s existence. The darkest hour has the greatest light. And Ceres takes our hand. She walks with us and tends us in this pain. She tends us while we grow. In August 2006 the International Astronomical Union announced a re-organisation of the way we view our solar system. Big new discoveries had led to definition and labeling issues. Surprisingly, even the word `planet` hadn`t got a clear definition. So when new planets were being discovered outside of Neptune`s orbit they had a problem. Do they re-write the schoolbooks every time a new planet is discovered or draw a line under the existing known ones and invent a new category for the discoveries? They decided to invent new labels and in the process re-categorised the asteroid Ceres. Suddenly she found herself in a new box with Pluto, Charon, Eris, Haumea and Makemake. Now she has the lofty title of Dwarf Planet…… but what does this mean? Within the orbits of Mars and Jupiter in our solar system, there is a big wide gap that has caused speculation since the 18th century. Astronomers of the time searched for a planet that the laws of physics told them must be there… … but they couldn`t find it! Finally, in 1801 a planet the size of Texas was discovered in the gap and called Ceres, but when other objects were also found there soon after, it was called an asteroid belt, and the newly named planet was demoted to the title of asteroid(1). Ceres`s position in the sky was no longer reported on, and the world lost interest in her. Then in the 1970`s someone began to plot her position in the sky again, and 2 astrologers wrote a book about her and the other planets in the Asteroid belt(2). Very slowly, the astrological community was waking up from a deep sleep regarding knowledge of the goddesses (planets) that the Asteroid belt contained. A big prod came in 2006 with the previously mentioned surprise announcement from the I.A.U. Then in 2008 a report in New Scientist(3) added fuel to the fire by suggesting that the planets Ceres and Pluto were once ONE, or at least came from the same place. This is in spite of the fact that there is a vast distance (up to 4 billion kilometers) and 4 planets in between them! This report was mind-numbingly spooky since this is EXACTLY the case in mythology. Ceres had a daughter or younger aspect called Proserpine. Pluto makes Proserpine his queen and she rules the Underworld with him. Apparently the 2 planets are made of the same stuff, and this doesn`t occur anywhere else in the Solar System. Putting it simply, Ceres represents Mother Nature, growth, grain crops, grieving and the bond between Mother and child. She is the growth of a seed into maturity, and then it`s separation and preparation for re-birth. This might mean the cycle of human life; from a seed - to a baby - to a maiden - to a mother; or that of agriculture and grain in particular. She is a symbol for separation and dying, and the mourning and grieving that goes with it, but she is also the energy that is with us as we prepare for re-birth, a new beginning or a re-generation. The earliest civilizations believed that the human soul went through a cycle of death and rebirth just like corn does. Her myth is one of many concerning the death and re-birth of vegetation, and it exists to encourage us to believe that human life does not end in death. Our soul is here to learn and grow, and it is a sad fact that sometimes the greatest growth comes with great pain, because usually we have to see something end or pass before we grow into something new. Pain and spiritual growth are proportional to each other. Ceres comes to us not just for the light of birth, but also for the dark of death. She takes our hand and walks with us through the Underworld of the darkest of nights, and her gentle sensitivity teaches us of our soul, and the reason for it`s existence. We see and feel the intensity of a flower. She tends us while we grow. Ceres was originally known to the Greeks as Demeter meaning Earth Mother,(4) and going even further back, to the ancient Egyptians as Isis. The best and longest account of the myth is told in a Greek song(5) called “Homeric Hymn to Demeter” which was written in the 7th Century B.C.E. In a nutshell, the story describes the agony and mourning a mother (Ceres) goes through, when her daughter (Proserpine) is abducted and taken into the Underworld to become Queen and wife to the Pluto. Eventually Proserpine is returned to her mother, because Ceres withholds all crops and food from the human Upperworld. The other gods cannot allow the human race to die, so they broker a deal that means Proserpine will spend part of her life in the Underworld, and part in the Upperworld. The object of this hymn was to explain the Mysteries of life and death in an indirect way, since it was forbidden to speak of them directly. Pluto has a golden chariot, which is not exactly a symbol of destitution and poverty and he did rule a third of the world, so all was not a complete disaster! In the Greek version,(5) Proserpine could still see the “star filled sky”, the “fish-swarming sea” and the “rays of the sun”, so she had hope. I think it might be important for us to reflect that she could still see life on Earth from the Underworld. Ceres made it a terrible year for humans whilst she grieved and yearned for Proserpine. Soon, the human race was near the brink of extinction and things were getting serious. If the whole human race died, then the gods would not get their worship. Humans get their vegetation courtesy of the gods, but then the gods get something back from humans. Homage and adulation by humans is an act of focus that generates an energy (spirit) which then passes into the Ether and feeds the universal spirit of the Godness. The god/desses desperately need this worship-generated energy, and it jeopardizes their way of living if they don`t get it. So Jupiter intervened and instructed Pluto to let Proserpine go. Jupiter assented that she should spend a part of the year underground and part in the company of Ceres. The myth is at pains to point out that humans are here to endure the gifts that the god/desses give us and we don`t seem to recognize the fortune in this. That although something may feel tragic and terrible, eventually with time and persistence something good will come of it. She insists her way is the “greatest boon and joy for immortals and mortals alike”, and that contact with her gives something of value. Ceres showed the mortals how to perform certain sacred rites and rituals, which were associated with love and the secrets of life and death. Whoever was initiated in these rites would “get a share of things” once they died and went into the “dank realms of mist”. Once a human has seen these things they are sent “Ploutos, - wealth personified, who gives riches to mortal humans”. These rites were called the Eleusinian Mysteries. Greek society had moved towards masculine or yang culture where individual importance and survival was becoming most important. Science and thought were controlling the more bestial natural ways. Nature or feminine energy such as Ceres`s, is willing to sacrifice single life in the knowledge that it is part of a Collective and ultimately the Collective must be protected. As society became more focused on analytical self-development, it would have been inherently natural to maintain an appreciation of Mother Nature and Ceres as a kind of opposite to the prevailing cultural trend. Probably to maintain the sacredness and importance, the exact content of these rites has remained a mystery, but in the Hymn we have a few clues. Persephone is referred to as a young seedling, and is in fact a different manifestation of the same cycle. 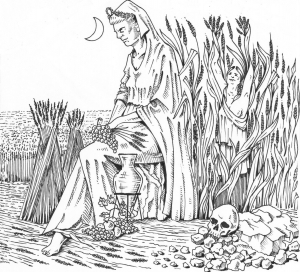 The seed and young seedling (Proserpine), the mother plant bearing an ear of corn (Ceres), the withering plant after harvest (old crone) and then the seed again. This can be put into human terms – human seed, embryo, baby, maiden, mother etc. These are different stages of development of the same Earthly process – life form emerging, growing and decaying. It is likely that the Mysteries explained this. In it`s simplest form, the myth explains the seasons. So when the myth talks of Ceres`s mourning whilst Proserpine is underground, it could be a metaphor for Mother Nature mourning whilst the seed is underground i.e. in the Underworld. This is the time when things must rest, and go out of sight (death) before resurrection. This is the fundamental message of the Mysteries. That humans also share this cycle or pattern. Death is not a finality, it`s a preparation for re-birth. Ceres`s energy is all about growth. How one life leads to another. How this year`s crop provides the seed for next years after a period in the Underworld. A seed will always promise new life. As you look at any seed you see the promise of amazing potential. Ceres is not only representative of the life and death cycle, she protects it. In the myth she could not stop Pluto or the Underworld taking her progeny for a while, BUT she did influence Proserpine`s return. She will simply not allow there to be no re-birth, and her power proved to be the most influential. Let`s reflect on that. She could not stop the death, but she ensured the re-birth. Ceres`s greatest gift is that of growth, which we see when Proserpine was returned, for Ceres immediately filled the Earth with burgeoning fields of bountiful new corn. This is what she does best. She will stay with us and wail and mourn with us during the loss, but always she seeks to grow. These days, Ceres guides souls into the Underworld…but also out again. WHY WILL CERES BE IMPORTANT IN THE 21st CENTURY? How Ceres`s Support will be Needed in Food Supply after 2006. Ceres was introduced into Roman worship along with 2 other old Greek deities in 496B.C. because the Italians were suffering drought and famine, and needed some help(4). Ceres must have been useful because 6 years later they built her temple in Greek style, with priestesses of Greek origin. She was designated a Goddess of the working or common classes, which gave her nationwide popular appeal. Ceres the planet was originally discovered at the beginning of an agricultural revolution caused by new ploughing methods devised in the early 1800`s. She has very strong associations with grains of corn in particular. From 2006 it became quite common to see gardening programmes on the TV entirely devoted to the growing of vegetables rather than the previous fashion of gardening makeovers, and the American president and U.K. Prime Minister, Gordon Brown made impassioned pleas for people to not waste so much food. 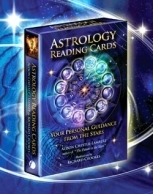 The saving of the crops from the floods of 2007 was clearly shown in the astrology of the time. Transiting Sedna and Neptune were in a long running square aspect (20° Tau and Aqu) and between them were flooding large parts of England. The weather forecast looked dire and the rain was relentless . Then in August Ceres edged in front of Sedna, standing between Sedna and the Earth and stopping Sedna`s influence. Within hours the rain stopped. The fields dried out, and a miracle happened – the harvest could be brought home. The image of how Ceres did this still brings tears to my eyes, it is a shame that at the time, so few of us knew of her brave and timely protection. Growing Babies, Child Abduction or Separation and Madeleine McCann. The terror of abduction is something that mothers in the 21st century struggle with and will identify with most readily. The abduction of Madeleine McCann from a Portuguese holiday resort in May 2007 was extremely well publicised all over the world. And no one will forget the sadness and support that we all felt. Kate and Gerry McCann were on a global stage, expressing the anger, anguish, bewildered grief and mourning which Ceres suffered in the myth. Madeleine`s horoscope has a close Sun-Ceres conjunction trine Moon, and there was a very significant Ceres energy involved on the day of her abduction, confirming that it was indeed an abduction. By progression, Ceres energy remains with and guides the child until mid 2009. Ceres gives us an understanding of nature, her cycles and the passage of time…including patience! When she was introduced to the Italian peasants, it was made most clear she was a goddess for the plebians. The daily work of the farming community all revolved around the natural calendar. There was a yearly plan and it could not be hurried. Sowing, weeding and harvesting were all at set times of the year, and this gave the working classes stability, routine and order. They had to stay with their land. This teaches patience and an acceptance of the dominance of a greater will than our own. Ceres says the 21st century is the time to re-learn this skill! Death of a loved one is a heartbreaking sorrow which no words of mine can bring comfort to. And the terrible pain of bereavement is an awful and tragic experience. But somewhere along that wretched journey there is a time when the bereaved desperately want to know `Why?`. And maybe understanding an individual loss in the context of the great cycle of life, can in time offer some solace, as we then understand that the soul of our loved one is only out of sight for a while. They will return to live again, and this is promised to us by the presence of Ceres. Her rites show us a better way to understand what death and the Underworld is really all about. Maybe, if we understand that there will be a re-birth we can find it more bearable. We Need to Change Our Image of the Underworld and Our Horror of Death. Our culture lives in fear and horror of the perceived atrocity of the Underworld. The Ancients Greeks had no such pre-occupation. It was the Catholic Church and Christianity that would introduce the horrors of a place of burning hell fires and purgatory. No such place existed for the ancient civilisations. This can be seen in a vase from the Ancient Greece(8) showing a one-off rare scene of the Underworld with the winged souls of the dead filling a giant container with the individual waters of knowledge from their own vessels. It is a calm and peaceful scene. We live our lives enduring pain and enjoying happiness. As the Book of the Dead(9) points out, we must drink, eat and make love. As we do this, our soul is constantly gathering experience and wisdom. When we die, our soul, spirit and mind return to their separate places in the Multiverse. The soul joins the collective soul and pours into it all the wisdom and experience it has learnt – some pour for longer than others! Does it help the bereaved to understand the context in which their loved one has passed on? I think so. It can be understood that their death contributes to a cycle of life in which they continue to play a major role. That single life is not meaningless; it continues to have great value. Another way of looking at death is to see ourselves as simply extensions of each other. Different stages of the same energy. There is no `individual`, and so no `individual` death. We are all connected. Life flows through the generations, which are born from each other. Certainly, as the years unfold after Ceres`s 2006 revival there will be a changing attitude to death and it`s circumstances. The National Health Service and Marie Curie Foundation have recently launched a joint initiative to promote home deaths. They want to open up discussion between the dying and their survivors, so that fear and taboo will not prevent the death rites being as respectful and honorable as possible. Currently, our taboo and discomfort at talking about and accepting the imminent death of a loved one, meant that their dying moments are in a resuscitation unit, far from the gentle hands of their loved ones, as medics vainly tried to hold back the inevitable tide of death. I think Ceres will slowly introduce us to the idea of letting loved ones go with dignity and peace. Home birth has become an aspiration…….now home death needs to be! In astrology, she is clearly a symbol of the parent-child bond. She is as much about the care and nurturing we give our progeny, as she is about the farmer`s care and nurturing, which gives a good harvest of wheat. In the early 21st century, it is likely that we will all experience parent/child bond issues, as Ceres makes herself known. I know of no one who hasn`t already struggled with strong mother/daughter psychological issues. Issues to do with control and breaking free. This will be hard for some daughters to take on board, and yet it is true that daughters carry the epi-genes and spiritual and soul inheritance of the whole maternal family lineage. The matriarchal energy is passed on from mother to daughter, generation after generation. Yep……you are your mother! A few might have experienced more profound sorrow or grief at separation from a parent or child, and for these unfortunate souls, reflection on the deeper meaning of Ceres may bring some understanding or comfort. Other Ceres issues can include family miscommunications, Ceres-style revengeful or devouring mothers, or the isolation of being alone with a child. If there is one reason for our lives here on earth, then it has to be that we should know and understand ourselves better. Unfortunately this is also one of the hardest things to achieve! It is my personal belief that the reason for pain is this - it is in our greatest pain that we achieve our greatest growth towards the goal of knowing ourselves. We wouldn`t bother otherwise. There is no greater love on earth than the love of a mother for a child. When this love takes us to our own `underworld` of death and humility whilst we are still living, then we are truly in the greatest pain known to mankind. A personal hell on earth. Surely then, this is when the strangest of things can happen. We grow. Our soul grows. We can see and feel the intensity of a flower. We can experience a side of ourselves that would be unknowable otherwise. We see our soul, and the reason for it`s existence. The darkest hour has the greatest light. And Ceres takes our hand. She walks with us and tends us in this pain. She tends us while we grow. (2) GEORGE, D., BLOCH, D., (2003) Asteroid Goddesses Berwick, Maine. Ibis press. (3) SHIGA, D. (19th July 2008) Has Pluto sent us a message in Ceres?. New Scientist, 199 (2665), pp 10. (8) BOARDMAN, J., (1980) Athenian Black Figure Vases. Singapore: Thames and Hudson. This excerpt was taken from Alison's book on the Dwarf Planets called `The Future in the Stars` which has been published by Findhorn Press. To order click here. 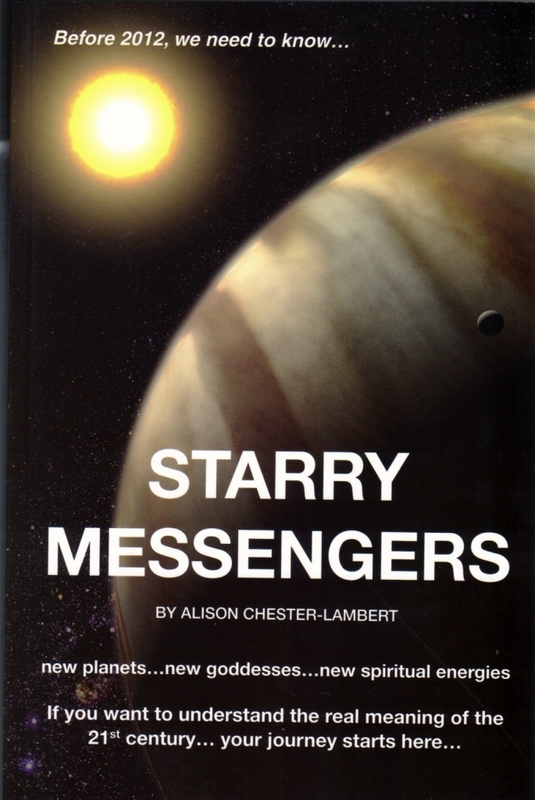 To order one of the rare first edition called `Starry Messengers` go to front page of this website. The following poem was sent to me by a client called John whose partner, Pat has died after a battle against cancer. His story seems to belong to Ceres, so I offered to publish it here. Thank you for sharing this with us, John. Why did you not go earlier? How I wish it weren’t you. What’s the patients name again? Just Mr Cancer stay still, and I will not fear. We don’t seem to have healing powers. All this support that you get? You try and get it! But I feel scarred and hideous, and want to hide away. Had a great time there, eh? Water everywhere, sod the mess. My Pats fading, so thin. Is this the start? Or is this the end. How’s Barrie? You ask, Had a fag with him last week in the night. Why didn’t I make you my wife? I want to remember you when you still had your life. Till sun up, cloths soaking wet.